I am always interested in how the world’s marketing and digital marketing leaders are breaking new ground online. A particular web design article caught my attention this week as it profiled Coca-Cola‘s recent corporate website re-design effort. 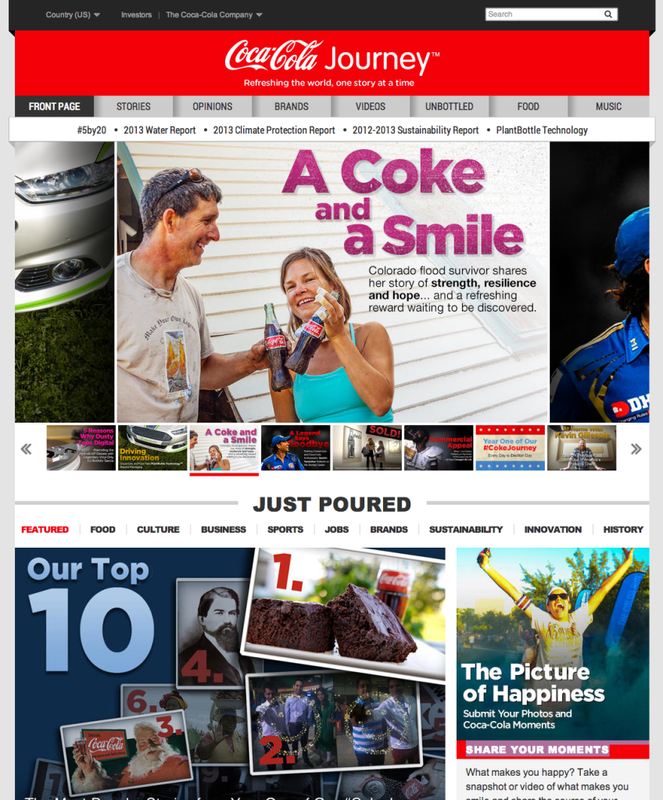 Coke’s new website looks more like a news portal than a corporate brochure. The upper area of the Coke website, seen below, puts much more emphasis on telling stories and sharing news than on selling product. It’s digital content marketing at its best and, in my opinion, a look at the future of the corporate web design. Instead of an image of a professional athlete telling you to drink Sprite on the site, there’s a story about how Coca-Cola played a role in the recovery of flood victims in Colorado. A look at Coke’s new, story-driven website. You will notice that the site is much more story-heavy, seeking to inform, educate, and influence around news–not sales or advertising. This allows Coke to draw users closer to the brand around stories of success, triumph, and nostalgia. There are even sections of the site for areas like food, culture, and business–just like a newspaper site. As you scroll further down the page (see below), there is further concentration on story with a ‘Most Popular’ ranking of stories on the site. This is reminiscent of the ‘Top News’ or ‘Most E-mailed’ sections of news websites. 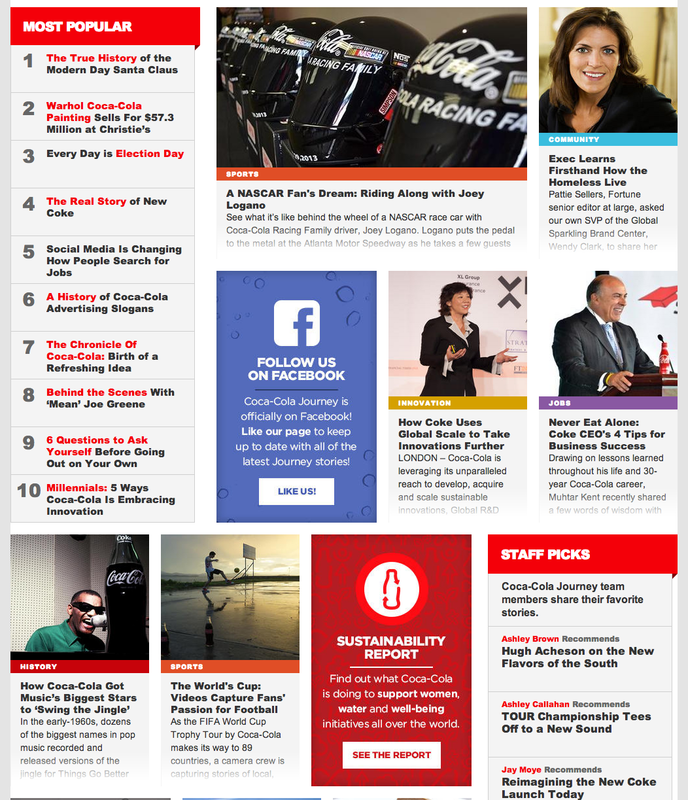 Coca-Cola’s new home page features widgets for popular stories. 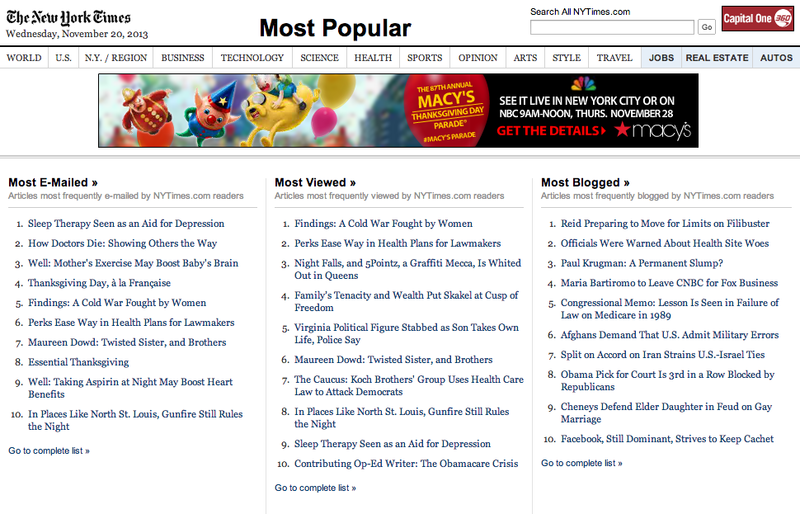 The New York Times website is a good example of how showcasing popular stories can work well. Looking at both the Coca-Cola site and the New York Times site reveals how a brand can become a true content publisher. News sites like the New York Times use widgets for popular stories. The potential take-away for digital marketers is that new ground is being broken in corporate web design as the promise of content marketing encourages brands to become publishers. As you think about your own company’s web strategy, be sure to consider how stories and news can help to bring your brand to life through its website.